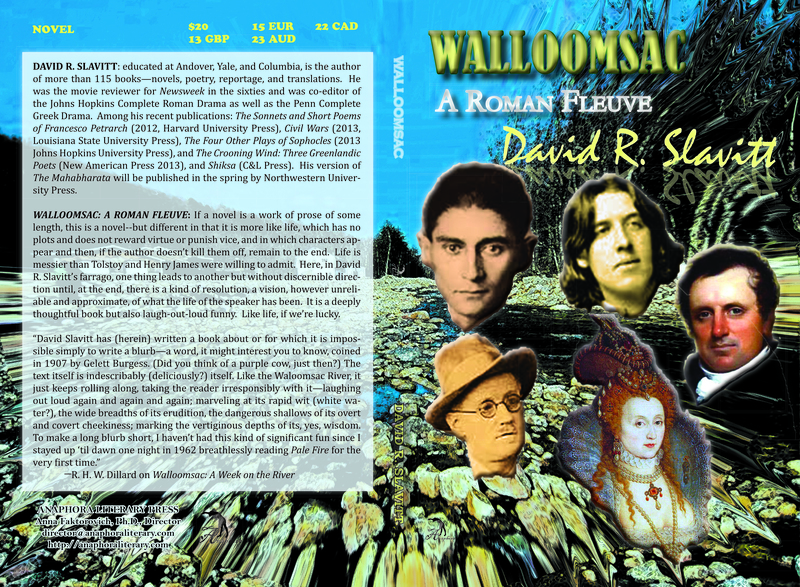 Walloomsac: A Roman Fleuve: ($20, ISBN: 978-1-937536-90-9, EBook ISBN: 978-1-68114-026-1, LCCN: 2014952145, 176pp, 6X9”, October 2014; purchase on: CreateSpace, Barnes and Noble, and Amazon; Kindle, EBSCO and TotalBooX editions: $2.99): If a novel is a work of prose of some length, this is a novel–but different in that it is more like life, which has no plots and does not reward virtue or punish vice, and in which characters appear and then, if the author doesn’t kill them off, remain to the end. Life is messier than Tolstoy and Henry James were willing to admit. Here, in David R. Slavitt’s farrago, one thing leads to another but without discernible direction until, at the end, there is a kind of resolution, a vision, however unreliable and approximate, of what the life of the speaker has been. It is a deeply thoughtful book but also laugh-out-loud funny. Like life, if we’re lucky. 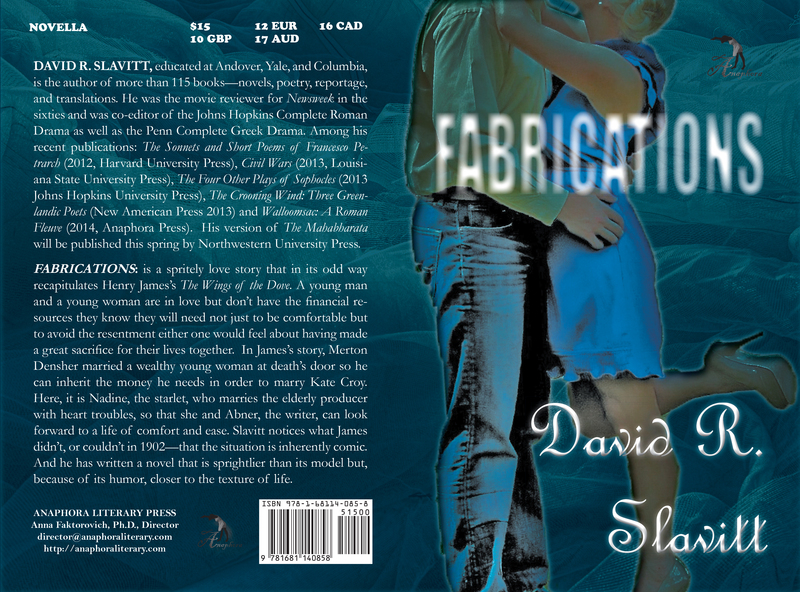 Fabrications: ($15, 6X9″, 64pp, Print ISBN: 978-1-68114-085-8, EBook ISBN: 978-1-68114-086-5, LCCN: 2015904378, April 2015; Purchase in print on CreateSpace, Amazon or Barnes and Noble; buy a Kindle for $2.99): is a spritely love story that in its odd way recapitulates Henry James’s The Wings of the Dove. A young man and a young woman are in love but don’t have the financial resources they know they will need not just to be comfortable but to avoid the resentment either one would feel about having made a great sacrifice for their lives together. In James’s story, Merton Densher married a wealthy young woman at death’s door so he can inherit the money he needs in order to marry Kate Croy. Here, it is Nadine, the starlet, who marries the elderly producer with heart troubles, so that she and Abner, the writer, can look forward to a life of comfort and ease. Slavitt notices what James didn’t, or couldn’t in 1902—that the situation is inherently comic. And he has written a novel that is sprightlier than its model but, because of its humor, closer to the texture of life. 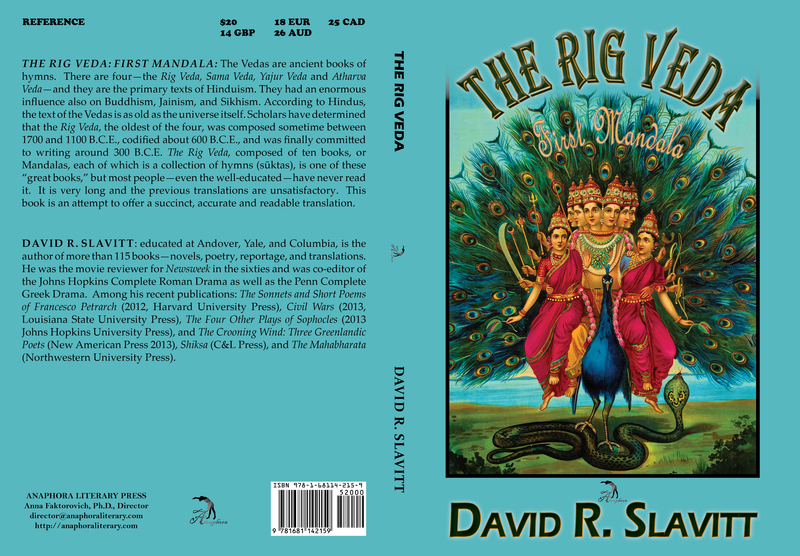 The Rig Veda: First Mandala: ($20, 258pp, 7X10”, Print ISBN-13: 978-1-68114-215-9; EBook ISBN-13: 978-1-68114-216-6; LCCN: 2015954420; October 2015; Purchase on Amazon or Barnes & Noble): The Vedas are ancient books of hymns. There are four—the Rig Veda, Sama Veda, Yajur Veda and Atharva Veda—and they are the primary texts of Hinduism. They had an enormous influence also on Buddhism, Jainism, and Sikhism. According to Hindus, the text of the Vedas is as old as the universe itself. Scholars have determined that the Rig Veda, the oldest of the four, was composed sometime between 1700 and 1100 B.C.E., codified about 600 B.C.E., and was finally committed to writing around 300 B.C.E. The Rig Veda, composed of ten books, or Mandalas, each of which is a collection of hymns (sūktas), is one of these “great books,” but most people—even the well-educated—have never read it. It is very long and the previous translations are unsatisfactory. This book is an attempt to offer a succinct, accurate and readable translation. David R. Slavitt: educated at Andover, Yale, and Columbia, is the author of more than 115 books—novels, poetry, reportage, and translations. He was the movie reviewer for Newsweek in the sixties and was co-editor of the Johns Hopkins Complete Roman Drama as well as the Penn Complete Greek Drama. Among his recent publications: The Sonnets and Short Poems of Francesco Petrarch (2012, Harvard University Press), Civil Wars (2013, Louisiana State University Press), The Four Other Plays of Sophocles (2013 Johns Hopkins University Press), and The Crooning Wind: Three Greenlandic Poets (New American Press 2013), and Shiksa (C&L Press). His version of The Mahabharata will be published in the spring by Northwestern University Press.